Check out this photo of Earthshine Nature’s spotted salamanders–aren’t they wonderful! Spotted Salamanders are fairly common in the forests of Western North Carolina but they are seldom seen because of their nocturnal underground lifestyle. They spend most of their lives in underground burrows searching for invertebrates to feed on such as worms and insects. They come to the surface in the late winter when the first warm rains of spring lure them onto the surface in search of mates and their egg laying sites–predator free vernal ponds and pools hidden in the forest. Once they find their pools–sites they return to yearly–they mate and then the females lay large masses of eggs. The eggs of the spotted salamander are contained within a rather firm yet jellylike mass that protects the developing embryos within. The egg mass is often covered with a specialized algae that shares a symbiotic relationship with the developing salamander larva. The larva exhale carbon dioxide which directly benefit the algae and the algae photosynthesize the suns energy creating an oxygen rich environment which gives the embryos the perfect environment for growth. Amazing! Count yourself lucky if you are in the right place at the right time to see Spotted Salamanders in the wild–they are a true treasure to behold. If you have temporary ponds on your property that often fill up in the late winter and spring then dry up in the summer then you may have Spotted Salamanders! 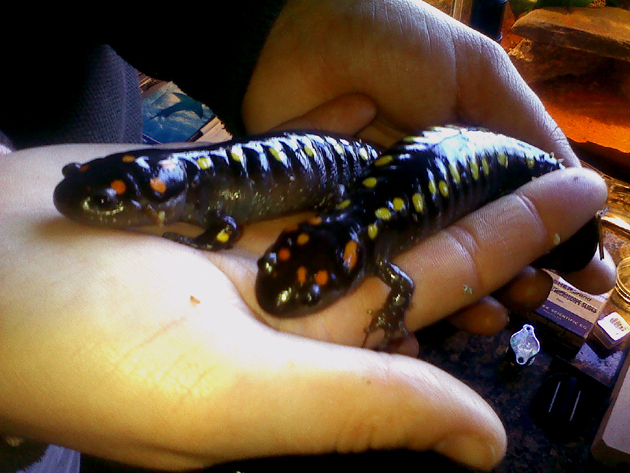 Please consider leaving the ponds intact for the benefit of wildlife that need them such as the Spotted Salamander. For more information and beautiful photos of Spotted Salamanders and their egg masses check out my friend Alan’s posting on the Wandering Herpetologist Blog. If you would like to meet our salamanders just email me and I will gladly arrange a visit.